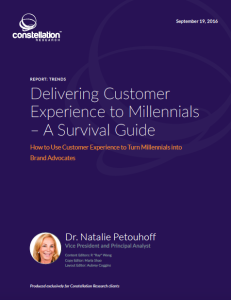 This research that I just completed is about how to use customer experience to turn Millennials into brand advocates. Why does it matter? They are different than other generations that have come before then. If you are in the Boomer Generation and are running a contact center there are some changes on the horizon that are key to know about and start preparing for now. Let’s look at some of the stats. There are >2 billion people in the world. Two billion are active on social media and 1 in 3 consumers prefer social to phones for service. Who’s leading the way? Those that were born into the world with nearly a device in their hand, well almost. And while this post is about customer service, we can’t really separate marketing, customer service and other disciplines. We’ll see why in a minute. Millennials are the largest, most diverse, educated & influential shoppers on the planet. They are positioned to be the wealthiest generation to date and have influence over their Baby Boomer parent’s choices & will inherent their money / real estate. In fact, by 2018 in US, projected income = $3.4 Trillion/year & surpassing Baby Boomer income. And millennials take online action all the time! This post is about customer service, but the initial engagement of Millennials is typically through efforts that tend to fall into marketing – though can also be done in customer service. You want to ask yourself are you really ready for the Millennials generation? Do you understand how different the y are? 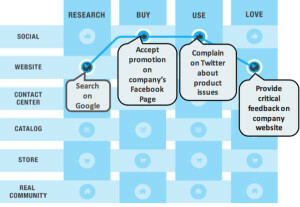 Map Your Generational Customer Journeys. This is Maya. She is 22 and social is her life. She may do some research using google and find your website. They she may decide to buy something from Facebook ad, then one the she’s using the product and finds it not up to her standards, she complains on twitter and then leaves critical feed back you your website. 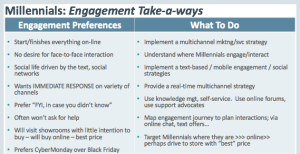 But Know As You Engage Millennials, Don’t Separate Marketing and Customer Service! When seeking customer service <1% will call customer! Know what Marketing said to the customer about a product and service. Know what the brand promise was and make sure the product lives up to it. And that customer service knows what that promised was so they can help transform a bad situation into a good one. Millennials want to trust your brand. As a result, WOM marketing will be done by Millennials. So here’s some take aways and look forward to a new report with much more details soon! I am speaking at OpenWorld on Tuesday Sept 20 at 11 AM in Moscone West. Come say hi! I want to hear your stories! Constellation Research Covering All Customer Facing Applications to Create Great Customer Experiences! What’s The News? 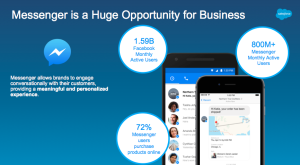 Salesforce announced Salesforce for Messenger Platform which will empower companies to create entirely new sales, service, marketing and app experiences for customers on Messenger. 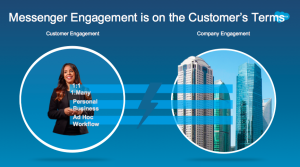 Salesforce for Messenger will enable companies to leverage existing business processes to make customer journeys even more relevant and personalized than ever before. This is the latest innovation in Salesforce’s ongoing strategic partnership with Facebook. Together, the companies are empowering companies to engage their customers through dynamic experiences around products, brands and moments—all connected to their business. Powered by Salesforce Lightning, this is a proven platform for more than 150,000 companies and millions of users, in which Salesforce for Messenger will deliver personalized engagement at scale with CRM data. What’s Happening With Messenger Facebook: Messenger’s growth is skyrocketing with its monthly active users growing from 500 million in 2014 to 900 million today. Often Marketing “owns” the Facebook page and had not worked out what to do with Customer Service issues. Nothing worse than getting a #fail in the middle of marketing campaign. For those companies that do have good relationships between Customer Service and Marketing, this will only help them to do an even better job of serving customers. For companies that don’t have this relationship worked out, the connection with Facebook Messenger may be the missing piece they need to connect the dots between Customer Service and Marketing. And this is perhaps why so many companies are so eager to embrace it as the new channel to extend customer engagement and create conversations. Salesforce extends its leadership in CRM with the launch of Salesforce for Messenger. Companies will be able to leverage Messenger as a customer engagement channel to deliver entirely new 1-to-1 experiences across sales, service, marketing and apps. Adding Facebook Messenger to the Checkout Flow in eCommerce: And because it is connected to the world’s #1 CRM platform, each Messenger interaction can be specifically tailored based on the context of the entire customer relationship. For example, a retailer will be able to embed a Messenger plugin on the checkout workflow on its website so a customer can ask any final questions before making a purchase. Since this Messenger exchange is also connected to the customer’s previous sales, service and marketing account records, the company can take a more personal approach to exceeding customer expectations. Companies will have an invaluable opportunity to use Messenger as a channel to build brand loyalty and deepen customer relationships by delivering seamless experiences across marketing, sales and service with Salesforce. Salesforce has been on a continuous journey to completely re-imagine CRM for the digital era and the launch of Salesforce for Messenger is the latest example of how it is expanding the market. 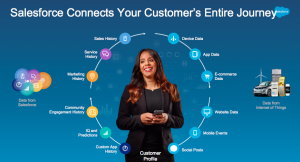 With Salesforce, companies can ensure that every interaction with a customer is an opportunity to create a memorable experience. In a world where the customer wants to get personalized, seamless care, this is an interesting step in the right direction. This post is about Gainsight. If you’d like a peek at the table of contents for this report and an excerpt, along with the full report, you can find it here. What Does Gainsight Do? Gainsight is one of the leading vendors of Customer Success Management (CSM) software. Founded in St. Louis, Missouri in 2009, Gainsight’s headquarters are now in Redwood City, California. Nick Mehta is the chief executive officer (CEO). As a customer success technology company, Gainsight helps companies manage their customer relationships while driving retention, upsell opportunities and organizational efficiency. The company has nearly $6 million in annual revenue and has raised $54 million in venture funding. How Does Gainsight Help Companies? Gainsight helps businesses grow faster by reducing customer churn, increasing upsell opportunities, and driving customer advocacy. Gainsight’s cloud-based product helps its clients track customers effectively throughout the customer lifecycle, monitors customer health consistently and makes companies truly customer-centric. Gainsight does this by providing a 360-degree view of customers to people in customer success, sales, marketing, product management and executive offices. Today, cloud businesses have unprecedented visibility and data on customers that can be harnessed with a customer success management platform. This opens up new opportunities and smarter ways to connect and engage with customers to maximize revenue and to determine what customers need and want so they remain loyal and provide high customer lifetime values. Why has Customer Success Management Become So Important? Before the opt-in economy, many businesses were focused on the initial sale. A great deal of money was spent advertising and marketing to potential prospects, enticing them to convert from a lead to a sale. However, little attention was paid to the after-sale experience and financial longevity of the client, even though poor customer experiences and churn still exist today after decades of research showing that after-sales service directly affects the financial stability of a company. In fact, it never made sense for companies to spend millions, or in some cases, billions of dollars in advertising, marketing and sales to then drive the customer to a competitor when the after-sales service experience is horrible. Yet poor after-sales service occurs every single day in many, many companies. How Does Customer Success Management Affect the Customer Experience? Customer Success Management (CSM) is based on the ability to deliver a consistent customer experience process – before, during, and in particular, after the sale – which results in maximized customer lifetime value and enhanced revenue that leads to increased margins and profits. This seismic shift to a post-sale, on demand, attention economy transforms the value exchange among customers, partners, suppliers, and brands. And as organizations move to digital business models, CSM plays a critical role in enabling brands and organizations to keep and deliver their brand promise as well as enhance their bottom line. My POV: How To Know When Vendor To Choose for Customer Success Management? When choosing the best option for CSM software for your organization, the choice will depend on the business goals of CSM initiatives, the degree to which CSM has been integrated into your culture and how well employees have adopted this mindset. It may be that some organizations will be further along the adoption cycle, while others will need internal champions to encourage and enforce the use of customer success software, processes and best practices. Are you considering customer success management? It’s time to make sure the customer is happy with the product they buy, after the sales process. Buyer’s Guide for Customer Success Management: Totango I’m in the process of writing profiles of vendors in the customer success management industry. These vendor profiles are a tool for buyers to evaluate their customer success management options before selecting a vendor. In addition to an overview of the vendor, these documents identify key differentiators, product offerings, and provide a number of features that should help a client create short list when determining which vendor to put on out an RFI or RFP. The first vendor I profiled is ServiceSource®. This post is about Totango. If you’d like a peek at the table of contents for this report and an excerpt, along with the full report, you can find it here. Totango, a vendor of cloud software for Customer Success Management (CSM), was founded in Israel and later moved its headquarters to Silicon Valley. Today, it maintains two offices, one in San Mateo, California and one in Tel Aviv, Israel. Guy Nirpaz leads the company as CEO and co-founder. Prior to starting Totango, he worked in the area of real-time Big Data as executive vice president of engineering at GigaSpaces Technologies, a middleware provider. He also worked as chief architect at Mercury Interactive, part of the Hewlett Packard software division. What Does Totango Do? With subscription and recurring revenue models on the rise in software, Totango helps clients improve product adoption and advocacy, reduce customer churn, and maximize customer lifetime revenue. Today’s cloud businesses have unprecedented data and visibility into user behavior and the business results achieved by their customers. Totango monitors this data to eliminate the guesswork when it comes to understanding customer health and engagement. What Are the Benefits of Using Totango? Using Totango, companies can pinpoint at-risk accounts that need attention; spot opportunities to increase user engagement and boost revenue; and then formalize and implement customer success best practices to scale up customer success operations across a growing customer base. What Companies Currently Use Totango? Totango is used by some of the fastest-growing technology companies, including public companies like Zendesk and Autodesk; mid-stage companies like BigCommerce and Jobvite; and innovative startups like Optimizely and Mixpanel. Before the opt-in economy, many businesses focused on the initial sale. Organizations spent a significant amount of money on advertising and marketing to potential prospects. The goal – enticing them to convert from a lead to a sale. Despite decades of research showing that after-sales service directly affects the financial stability of a company, organizations paid little attention to the after-sale experience and financial longevity of the client. Consequently, organizations never should have spent millions, or in some cases, billions of dollars in advertising, marketing and sales to then drive the customer to a competitor when the after-sales service experience was horrible. Yet, poor after-sales service occurs every single day in many, many companies. What is Customer Success Management? Customer Success Management (CSM) is based on the ability to deliver a consistent customer experience process – before, during, and in particular, after the sale – which results in maximized customer lifetime value and enhanced revenue that leads to increased margins and profits. A shift to CSM happened because we live in a continuous, opt-in economy, where the value of customers is determined by how long they stay customers and if they continue to increase their purchase amounts over time. Because of our opt-in economy, companies must prepare themselves to deliver great, continuous and consistent customer experiences. Why Has Customer Success Management Become Such a Big Deal? This seismic shift to a post-sale, on demand, attention economy transforms the value exchange among customers, partners, suppliers, and brands. And as organizations move to digital business models, CSM plays a critical role in enabling brands and organizations to keep and deliver their brand promise as well as enhance their bottom line. My POV: How to Choose a Customer Success Management Vendor: When choosing the best option for CSM software for your organization, the choice will depend on the business goals of CSM initiatives, the degree to which CSM has been integrated into your culture and how well employees have adopted this mindset. It may be that some organizations will be further along the adoption cycle, while others will need internal champions to encourage and enforce the use of customer success software, processes and best practices. It’s never been more important make sure that customers are happy not only when they buy the software, but also after they have bought it. Otherwise, in this opt-in economy, clients may opt out of using a vendor, to look for a vendor that can deliver on their promise of great customer experience, increased revenue and decreased costs. 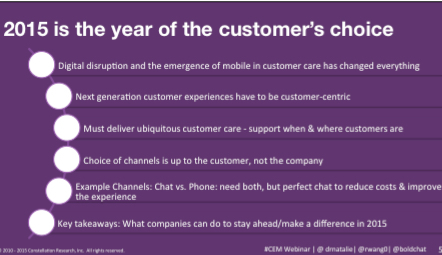 Social Customer Care, simply put, has become an expectation amongst consumers. Social Customer Care is one of the most important aspects of the customer experience. Telling your community that you’re accessible on social channels delivers a strong message. Your community and supporters are online, and it is fundamentally changing how and where constituents look for support, and how they engage with you today. I remember when I was first on Twitter back in 2008. It seemed like a great place for customers to express their frustration. But I could see where organizations might not see the real ROI. Part of the reason is of the 1-9-90 rule. That’s a rule that is really an approximation and it goes like this: about 1% of population post in social networks, 9% respond and about 90 lurk (read, but don’t post.) Of course the ratios change for different industries, but the take-a-way is that most people read, they don’t post. This lower posting (10%) rate might lead many organizations to think they are not very many people are on social networks. However, what I learned in speaking to many consumers and even B2B business buyers is that people do look and they do read. And they form an opinion of a company based on what they see. They may not post, but they do make a decision or form an opinion about a company and how it treats it’s customers. So in actuality, that 10% that post is like the tip of the iceberg, where the affect is really on the 90%. So that’s why, for organizations of any size, listening to constituents online not only presents the opportunity to uncover and address complaints and issues, but also the opportunity to learn, improve, and engage your audience in new ways to strengthen – or build new – relationships over time. I remember one time when I was trying to fly to London to give a speech on customer service. The plane I was supposed to take had mechanical issues and was not going to take off for a long time. If I took that flight, I would miss my speaking slot. I saw another flight that was leaving within 30 minutes to London and went to the gate to see if I could get on that flight. They said no, even though there were seats. I then tweeted to the airline for help. They responded within 30 seconds. They asked me to Direct Message them with the issue. Low and be hold, within 5 minutes on was on that flight that the gate attendants said I could not get on. I went up to the gate attendant’s and showed them that I was on the flight they had denied me access to. They said, “How did you get on?” I said Twitter. And they were really surprised. In June, I will be leading a panel where you dan learn how HP, Alex & Ani and Honeywell not only provide exceptional service to their customers through social channels, but how they capitalize on these interactions as a marketing opportunity. It’s at the Salesforce Connections Conference in NYC. If you are skeptical about social customer service and how it affects the brand and can actually work to your advantage as positive Marketing, please join us! 2. Determine if your brand is being talked about: It could be, no one is talking about you; it could be they are and it’s negative or positive; you’ll also want to monitor your competitors to see if people are talking about them and what’s being said. 3. Once you see if anyone is talking about your company in social networks, and whether it’s positive or negative or neutral, you can then create the beginnings of a social media customer care / marketing strategy. But it all starts with listening first. You have to know if you are part of the conversation online or not. 4. If no one is talking about your brand online, then that’s when you have to figure out a strategy to begin the conversation. If the sentiment is negative, then you have to figure out why and what you can do about it. Sometimes it maybe a product defect or poor service. Those are within a brand’s control to fix. And if it’s positive, then a strategy to keep that conversation alive and positive is also required. Social Networking is Not for the Faint of Heart. What’s your point of view on social customer care and how it can affect marketing and brand reputation? This report is about the The State of Customer Success Management in 2015. Constellation’s research team delivers its inaugural series on the state of the state. The state of the state research explores the impact of digital transformation, next generation customer experience and matrix commerce from a systems perspective considering the political, economical, societal, technological, environmental, and legislative point of view. This research report explores a key area – Customer Success Management (CSM). It goes into detail about how next generation customer experience is guiding the success of Customer Success Management. A shift to Customer Success Management is emanate because we live in the world of a continuous, opt-in economy, where the value of a customer is determined by how long they stay a customer and if they continue to increase their purchase amounts over time. As a result, companies must prepare themselves to deliver great, continuous and consistent customer experiences. Before the opt-in economy, businesses were focused on the initial sale. A great deal of money was spent advertising and marketing to potential prospects, enticing them to convert from a lead to a sale. However, little attention was paid to the after sale experience, even though the ubiquitous poor customer experiences still exist today after decades of research showing that after sales service directly affects the financial stability of a company. It makes absolutely no sense to spend millions or in some cases billions of dollars in advertising, marketing and sales to then drive the customer to the competitor because the after sales service experience is horrible. Yet this occurs every single day in many, many companies. Customer Success Management is based on the ability to deliver consistent customer experience process, before, during and— in particular, after the sale which continuous loops into increase customer lifetime value, enhanced revenue, increased margins and profits. Delivering a brand promise instead of a product or service requires new approaches. Clients who believe in customer experience build CSM organizations. CSM delivers more customers, less churn, and higher margins, really! Expect larger customer experience vendors to incorporate these principles or acquire in this space. The reason some companies like Zappos, Nordstorm, Lexus, which are all considered “luxury” brands can offer excellent service is that their business model is built with enough margin to provide the people, process and technology that can deliver great experiences. Businesses must move away from the thinking that this type of service is limited to only luxury brands and they themselves must stop cutting corners on CSM. All businesses that expect to make it through the next several years must begin to change their business models immediately so that they have the margin to provide great, loyalty creating experiences. 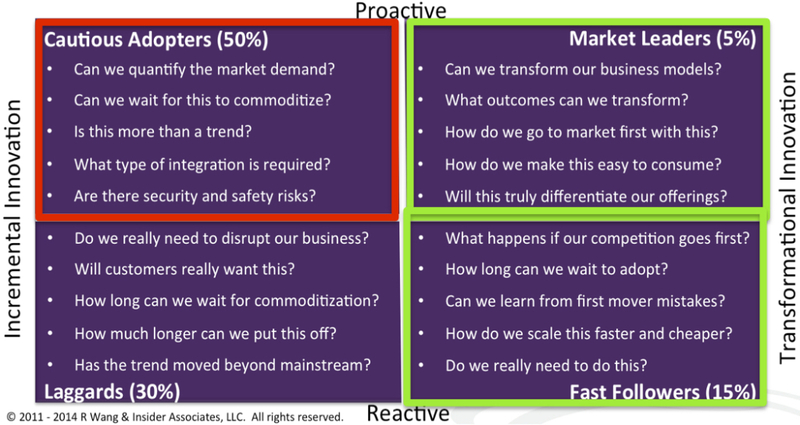 Is your company ready to transform how it treats its customers? For information on this report you can find a snapshot here. This post is about five ways to deliver exceptional customer care in 2015. Customer service and support is shifting to a customer success management model. This is the ability to deliver great, consistent customer experiences across all channels that drive retention, revenue and margins. Without this, customer experiences will not meet expectations and customers will go elsewhere, resulting in decreased retention and, in return, revenue. As part of a trusted group of advisors that helps Customer Service Professionals, as well as people in other parts of the organization – like Marketing, Sales, CXOs- CEOs, CIOs, CTOs to CMOs- we help people understand what digital transformation and disruption really means for their business and their future. And there’s a lot of hype around digital disruption. But let’s but some of that to bed. We are in an opt-in economy, where customers can easily find information about a company, its reputation, their products, their reputation online and they can find all this from sources other than a brands marketing and advertising. It’s not that those disciplines are not important, but we want to look and see if the brand is fracturing it’s brand promise, it’s reputation… by not delivering on the brand’s promise somewhere in the customer’s journey–i.e., within their interactions and engagement with the their customers. Is the brand delivering the products and services it’s marketing and advertising? Actually the sources most people trust the most are people like the themselves, which is providing a great challenge to those in marketing and advertising. Why spend the money there when you can develop online advocates? We’re not saying that advertising and marketing will ever go away, but this is something brands need to pay attention to, because there is a huge cost savings if brand advocacy is done well. You’ll want to ask yourself, “Where are our customer talking about our products?” Where are our customer sharing their thoughts and experiences? (62 + 24 = 86% give it a 4 or 5 star) So what does that tell other customers? Most people think it’s a pretty good product! Those online comments leave an impression for other customers to see – and the content is permanent like cave paintings, there for millions of people to see. And in social media – because there is the 1-9-90 rule ~1% post, 9% respond and 90% read without posting, think of the number of people who looked at this review and never post. Most of the potential customers never post. But they do make buying decisions based on what is posted. And this is just the tip of the iceberg of what people are thinking about your company. They could visit the site, and if the reviews were bad, they could get bad impression and leave and you’d never even know it. How many times a day does this happen to the millions of companies online today? A lot. 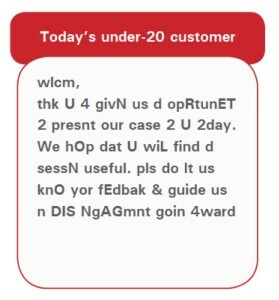 And this company actually answers customers questions. They have answered 141. 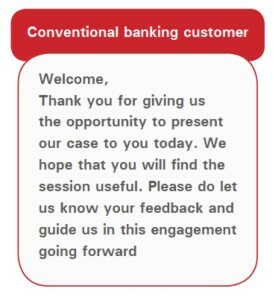 And this tells you they are listening and responding to customer feedback. And customers actually vote on what the company said, i.e., on whether they think the answer the company gave was honest and truthful and helpful… So what the digital disruption means is that there’s no where to hide… We are truly in an opt-in economy, where customers can easily choose to either opt-in or just as easily opt-out of doing business with you. Customers can more easily decide to buy from a competitor than ever before, especially if you loose their trust. Much of this change is due to software being delivered as a service (SaaS) where if the brand doesn’t like the service its easier to get out of the contract than it was in the days of on premise software and hardware. But also in the B2C world, customers can easily find information about a company, its reputation, their products, their reputation online and from sources other than a brands marketing and advertising. It’s time to rethink everything and understand what the digital disruption means to your business. The digital disruption means you have to be: Transparent — Authentic — Genuine — Honest — Respectful — Helpful — Kind — Trustworthy…. The digital disruption is changing business, especially because of CoIT = Consumerization of IT. That means that customers want it to be frictionless, easy and fun to deal with your company. They have grown accustom to wonderful user interfaces like Google and Facebook. User interface design is extremely important. It is difficult or easy to do business with your company? Do you know? Have you shopped at your own store – on and offline? Digital disruption means being customer-centric. This means you need the strategy to change how the company approaches its customers: a customer-centric strategy, customer-centric processes, customer-centric technology and customer-centric people (employees, partners, stakeholders…) For many companies to get to a customer-centric place, it may require organizational change management. A big part of the digital disruption? Mobile! Digital disruption means delivering ubiquitous customer care. What’s the difference? Omni–channel:–It implies it’s the customer’s view of their interactions with the company,–Orchestrated across all channels in a seamless, integrated and consistent context- there’s a lot of hype about this – most companies may want to do this, but are they? Many software companies say they can provide all of this, but do they really? Ubiquitous channels–Means providing support when and where ever customers are, 24/7 and customer’s obsession with mobile devices is driving what we calling the need for ubiquitous channel capabilities. So we’ve learned that customers have more choices than ever before. They also have specific preferences, needs, expectations, wants …with unboundless options; will they pick your company? They will if you recognize Customer Service as Customer Success Management. Don’t just care about the customer as a lead; Don’t just care about the customer as a sale; Don’t just care about the customer in service; Care about the customer in every interaction. And create great, continuous, consistent experiences. Why? 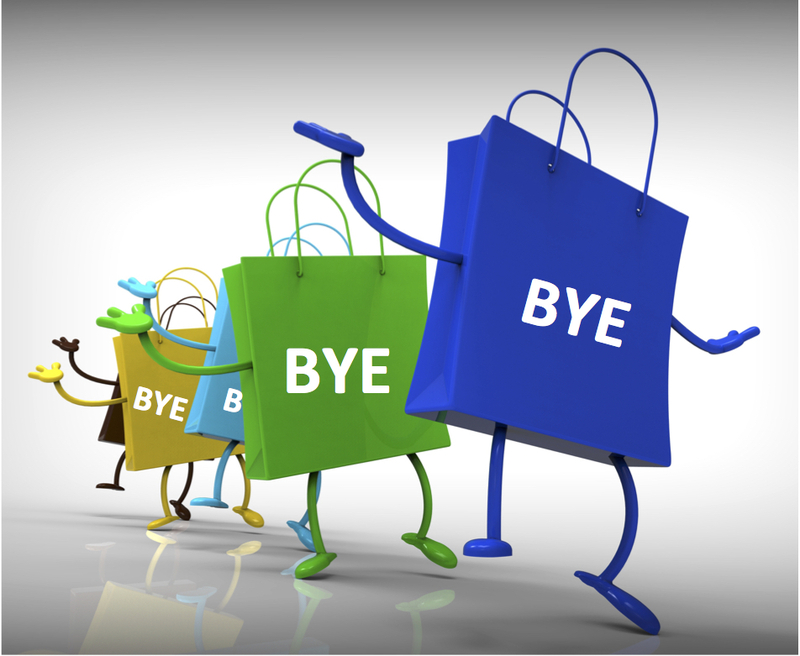 It will drive retention and revenue and that equates to an increase customer lifetime value. Bad experiences: lost customers. No Customers, No Business™. It’s that simple. Customer success management is about customer lifetime value: i.e., How long a customer buys from you? How much do they buy each time? How much does their purchase amount goes up over time? You will want to continuously increase all of these for each and every customer and continuously, gain more customers and higher customer lifetime values. Most companies are confused about what the digital disruption means to their business, both from an economic and operational standpoint. 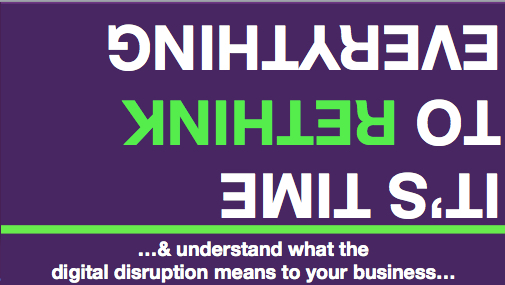 If businesses don’t understand the digital disruption, they will find it difficult to prepare for it. If we look back for a reference point, we can see the authors of the book “The ClueTrain Manifesto” predicted back in 1999 that there would be a point in time when customers, using the Internet, would be able to talk to each other freely, without the interference of a company. This would lead to a more transparent representation of a company’s products and services. Instead of being disguised in advertising and marketing messages, products and services from companies would be openly and honestly discussed by current, potential and past users. That prediction has come true. It’s happening right now. If a company decides it wants to deliver great digital customer experiences, then it must be prepared for the work. And in most cases, it is a tremendous amount of work. Many will think of it as putting more functionality into the website or adding a social network or adding mobile. However, it is more about understanding your customers and their needs and desires. The second part of the digital disruption is that we have more data than ever before to make better, more informed decisions about our business and about how we treat our customers. 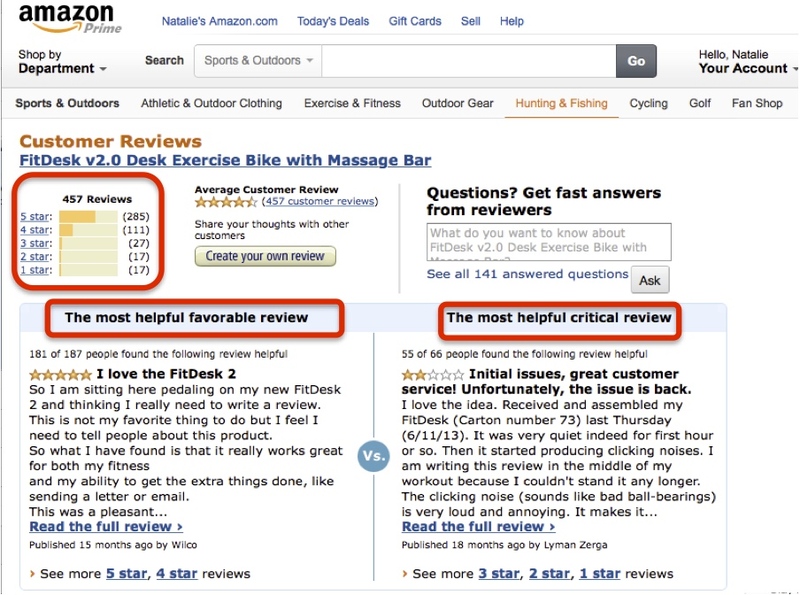 This idea to use customer and employee feedback and data is not new. It comes from Edward Deming, who wrote over 50 years ago about the necessity of listening to all your sources, especially those closest to your customer, and to incorporate that data into your products and services. If a company actually does this, its products and services will no doubt improve. Now consider other companies that don’t bother to listen and make changes. Customers are noticing and naturally gravitating to companies that are changing with the help of customer input. At the end of a couple of years, consider who you would like to do business with? The answer is obvious – companies who care enough to listen and change. And companies have never had this type of transparent representation of their reputation. Now they must be what they say they are – or they will be exposed. Everything that happens in a company at some point affects customers and their experiences with that company. So providing great digital customer experiences means that not only do senior executives have to support the goal with time, budget, resources and input, but so does every single person in the organization – in both the front and back offices. What digital transformation requires is that the customer experience be examined – and often redesigned. While digital transformation is made possible by the right technologies, digital transformation goes far beyond just technology, but instead extends into infrastructure, organizational structure, culture, and service-oriented leadership. A commitment from CxOs is needed along with internal change agents; it’s a change in the corporate DNA. Create customer journey maps and use the data from them to show how a customer-centric and digital-first approach is needed. With data projections of what could be accomplished, an organization will want to set goals and put a measurement system in place. A measurement system will show how the digital transformation produced results like increases in lead conversion rates, traffic, leads, engagement, first contact resolution and use of self-service. When executives see real business results, they are more likely to continue to support the initiative. You’ll want to benchmark where you are with respect to 3 top competitors. Then see where your gaps are. It is also about understanding how your competitors deliver those products and services online and offline compared to your company. Once you have mapped out your customer journey (from the customer’s point of view – not the company’s), compare it to your top three competitors. Take screenshots of your competitors and put them in a powerpoint presentation and give it to someone in the company who has positional power to make change happen. Then redesign your customer engagement and digital strategy with the input from your customers and understanding what your competitors are doing better than you. The gaps show you what’s missing and what you need to do next. It might be strategy; it might be technology; it might process and it might be people- who you have hired, their training, their attitude… And understand it’s all got to to be there to make customer service turn into customer success management. Savvy Customer Service Professionals are leading their companies, not only to advance customer service, but they are leading the whole company to new heights, by turning customer service into customer success management. Will you be the next hero?